The majority of plumbers start their businesses to be residential contractors. This means that they advertise to and target the general public as their customers. As plumbers become better at the work they do, they may start to receive offers to do bigger, commercial jobs. Schools, shopping malls, airports, restaurants, or hotels require areas where plumbing plays an important role. One of the most common plumbing applications in these and other relater commercial establishments is the restroom. When running a larger business, the last the owners and operators want to have on their mind is the upkeep and maintenance of the restrooms in the facility. This is why quality products need to be used in the restrooms. With the possibility of large amounts of people going to these different businesses, there needs to be facilities that can accommodate the consumers. For men’s bathrooms it is important to have some urinals available. On those urinals there should be some sort of automatic flush system (we all know that there aren’t too many people out there who manually flush the toilet). Many commercial toilets (the kind found inside of a restroom stall) are designed to be installed on the wall of the bathroom. This makes it easier for the staff who have to clean the bathroom. Instead of cleaning around a toilet bowl on the ground, the area around and beneath the toilet can be cleaned easily using a mop and bucket system. These toilets are also built to be durable so unless some sort of freak accident occurs, the unit will last for years to come. With the use of automatic flushing technology, employees and customers don’t have to worry about someone else forgetting to flush. 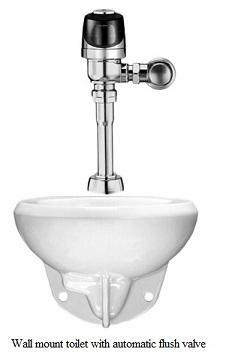 There are many types of flush valves available on the market, including the older manual flush valves. 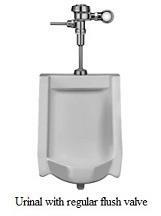 For businesses that can’t afford the automatic flushing technology, these are a good economical option. There are replacement parts available, when needed, and many of these parts can be found at a local supply house. These types of valves can be used for toilets in the stalls or urinal units. Although automatic flushing units are more expensive, they may be the better choice for places like airports and shopping malls (maybe that’s why they charge so much for the products offered in these places? I don’t know, I’m just saying…). Since these restrooms will most likely be used more times per day than the average household bathroom, the products that are available as “commercial” have been designed to be more durable. This means that these commercial products will last longer, if they aren’t damaged on purpose, but it also means that these types of products will be more expensive. Anyone who has started a business knows that for things to work out, they shouldn’t cut corners and make sure that they are getting commercial grade products. Doing so will save time and money, in the long run. Make sure you have the right products for your business! Click here to find some.